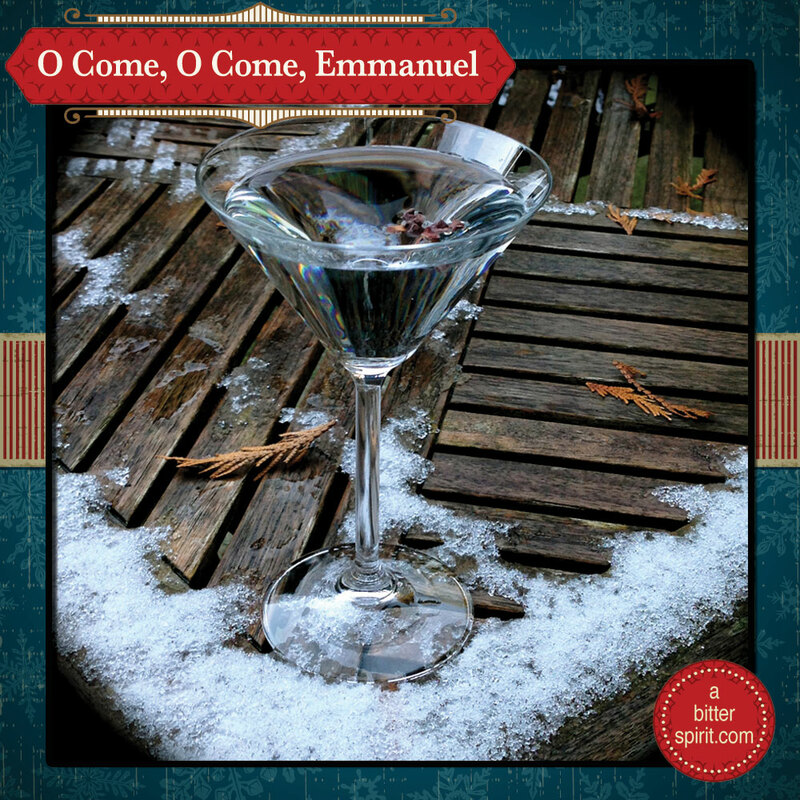 Today's carol is O Come, O Come, Emmanuel ... one of Kate's favourite carols. This carol is really old; or, people think it is. There is an argument to be made that it has its origins (at least its melodic ones) in a series of "antiphons" or chants that were sung by monks in the eighth century. But the carol in its current form didn't make an appearance until the mid-to-late 1600s when it was assembled by a Jesuit hymnographer and incorporated into a Psalter. When planning our cocktail around this carol, we noted "Super old. Maybe some monks." (seriously, check the spreadsheet). And what is super-old and monk-influenced? Chartreuse. But we also wanted to keep it simple; monks don't go in for frou-frou drinks. And what's more simple than a martini? So this carol's cocktail is a little riff on a Chartreuse martini. Pour chartreuse into cocktail glass and coat sides of glass. 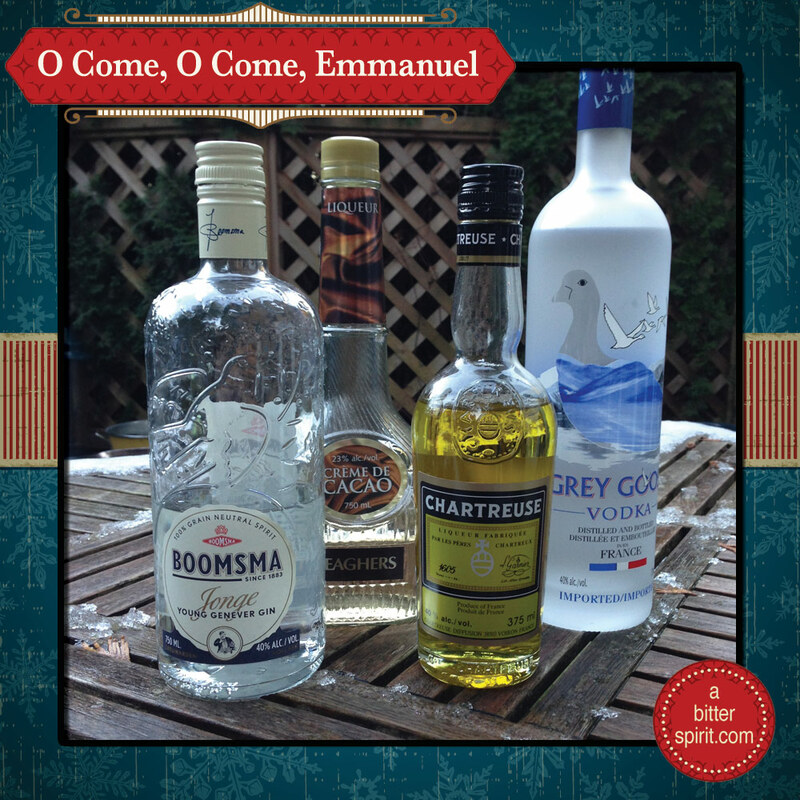 Pour out (or drink) excess. Combine vodka, genever and Creme de Cacao in cocktail shaker. Add ice. Shake and strain into cocktail glass. Garnish with a couple cocoa nibs. The astute among you may notice that the Chartreuse in this picture is yellow, not green. The recipe uses green. We were drunk when we took this picture. Before adding the Creme de Cacao, to get the chocolatey flavour, we tried a couple of different bitters. Fee Brothers Aztec Chocolate Bitters didn't work at all. Apothecary "The Darkness" Bitters were good, but not quite what we were looking for. So we went with the straight-forward Creme de Cacao and it was perfect. Exploring spirits, bitters, and infusions - and the interesting concoctions that result.